Born 1975 in Pardubice (Czech Republic). 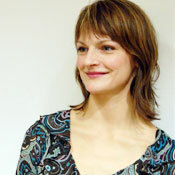 She studied Dance at the Dance-Conservatory of Prague and studied Dance Pedagogy at the Folkwang University in Essen. After her studies, she had different engagements in different theatres and dance ensembles in the Czech Republic, in Slovakia, in Austria, in Germany and in Switzerland. Since 9 years, Hana Zanin cooperates with the culture and education associacion "Ich bin O.K." for people with and without special needs in which she works as a teacher and choreographer. As a dancer she took part at different "Ich bin O.K. "-productions, for example "Off ballett special" or at the opening at the Vienna opera ball. Since 2009, Zanin is together with Attila Zanin head and artistic director of the culture and education associacion "Ich bin O.K." for people with and without special needs in Vienna. 2014 "Getrennt-Vereint" 2010 "Moha in you" in the context of the festival " Tallers Musicals D'Avinyó" (Spain) and "ProART Festival" in Prag 2009 "Moha" in Tor 2 in Essen-Werden and "Tanzhaus" NRW in Düsseldorf 2007 "locus arboris - Platz des Baumes" Performance on the streets of Essen-Werden 2006-2007 together with Attila Zanin: "lonely people" (contemporary dance meets Hip-Hop) Festival "638kg Tanz und weitere Delikatessen" - 4. KUNSTTAG in Essen. BRNO, 17. - 21. 7.